Matt Case is the Deputy Sports Editor for The Berkeley Beacon. He is a junior journalism major with a minor in radio. Originally from Burlington, Vt., Case moved to Boston in August of 2015 to begin at Emerson College to pursue a degree and a career in one of the largest sports cities in the country. In his first semester with The Beacon, he wrote on a multitude of Emerson teams including Mens and Womens Soccer, Mens Basketball, Womens Volleyball, and Baseball. Before college Case was editor-in-chief of Rice Memorial High School's newspaper, The Knightly News, for two years. Case can be reached at matt.case25@gmail.com or at 802-598-4791. Case can be reached at matthew_case@emerson.edu. Katie Rhee knows she shouldn’t be playing sports, let alone one with heavy contact and no helmet or pads. 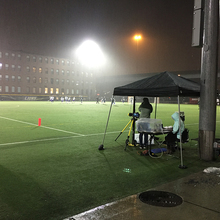 Minutes before their game against Lesley in the Charles River Cup last month, the players of Emerson’s women’s soccer team learned the news of standout Paige Haley’s injury, a torn ACL. Emerson’s men’s tennis team is beginning its season in the fall for the first time. 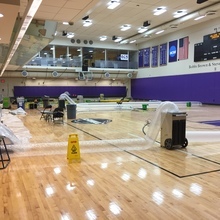 The Bobbi Brown and Steven Plofker Gym was completely shut down Monday until at least the end of next week, athletics’ director of media relations Matt Ulrich said Wednesday. Deputy Sports Editor Matt Case talks playoff chances for Emerson College's women's basketball team. 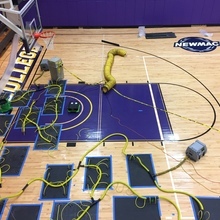 All Emerson athletics home games will be moved to away locations this week due to flooding in the Bobbi Brown and Steven Plofker Gym, said Matt Ulrich, athletics’ director of media relations and game operations. Dr. Charles Steinberg, president of the Pawtucket Red Sox and executive for the Boston Red Sox, was named director of sports communication at Emerson Tuesday, the college announced. On Tuesday, Emerson grabbed its first road win, defeating nonconference opponent Connecticut College 63-57. McCafferty is a walk-on for the women’s basketball team. She wasn’t recruited directly by Gould, nor did she send highlight reels or stats to him during her high school career. Rather, she was first accepted into Emerson’s writing, literature, and publishing program, and then earned a spot on the roster after the school year began. Women’s basketball: Newfound depth, new heights? Even with a 13-6 overall record so far this season, surpassing last year’s, the door for a tournament bid is quickly closing for the Lions. “This team has evolved over the years and is making their own history in a very short amount of time and they’re proving that they can beat good teams,” Suvak said. The squad has three more regular season games, all against NEWMAC opponents. The common theme of last year for the Lions, who finished 5-13 overall, was injuries. But through the first three games of their current season Emerson has stayed healthy, remaining sprain, tear, and fracture free. Students, coaches, and entire institutions are inevitably going to cheat. 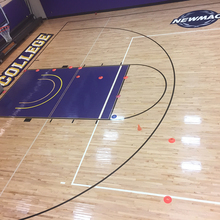 From November to March, men’s and women’s basketball games fill the Bobbi Brown and Steven Plofker Gym in Piano Row’s basement. Division III athletes don’t get scholarships for performance on the field. They’re rarely found on television, and they almost never go pro. Freshman Cameron Radenberg was making waves early in his Emerson lacrosse career. Through the first three games of this season, the attack was tied for most goals among the Lions, and was second in assists. Emerson’s teams are seemingly improving in the New England Women’s and Men’s Athletic Conference with more playoff berths and the school’s first postseason win this winter. A few programs, however, are still looking for their first regular season conference victory—one is men’s tennis. Playing 10 games in seven days of 80-degree, nothing but sunshine weather, it was all balls, bats, and bases for the Emerson softball team, who got a sampling of their squad’s talent in its annual trip to Florida. The Emerson athletic administration needs to raise a new banner in the Bobbi Brown and Steven Plofker Gym. Thirteen ties and nine lead changes made for a back-and-forth competition between no. 4 Springfield College and no. 5 Emerson in the quarterfinal of the New England Women’s and Men’s Athletic Conference men’s basketball tournament. Nearly four years ago, Emerson College was voted into the New England Women’s and Men’s Athletic Conference as its 11th member. The move was a step up for the Lions, advancing out of the Great Northeast Athletic Conference to compete with national championship-caliber teams. Nationally recognized sport psychologist Dr. Joel Fish spoke to Emerson student-athletes, coaches, and administrators last week about the mental difficulties of competition and how to succeed under pressure. Feb. 6, 2014 — Nearly two months after upsetting the number one team in the country, the unranked Emerson Lions basketball team was matched up on the road against the third nationally ranked Engineers of Worcester Polytechnic Institute, a squad they had lost to just four games earlier. 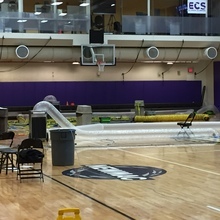 Emerson women’s basketball games have a different look this season. A new, and unexpected, rule has changed the format to generate better moving, and more entertaining contests. This season’s men’s volleyball team may have grown in numbers since last year’s early playoff exit, but competing as one unit while getting multiple players involved in matches will be key for the Lions to become a competitive postseason threat. The Emerson baseball team has found its first home field. The men’s basketball team not only competed in last weekend’s Greater Boston Shootout, but fought for a cause, too. Head coach Ben Read and his volleyball players are still trying to process the season. For the third consecutive year since its conference move, the women’s soccer team has missed the cut. Emerson’s men’s basketball has a packed team as four new recruits join 10 seniors and five others for the 2015-16 season. The women’s volleyball team will be holding their fourth annual “Dig Pink” match Thursday against Lasell College in honor of Breast Cancer Awareness Month. The women will be sporting both pink warmup t-shirts and socks for the event. For men’s soccer player Dan Knight, earning a starting role this year was a no-brainer. As a senior, the three-year substitute was one of the most experienced athletes on the team heading into the season. He expected to be on the pitch at the start of every match of 2015. Since before the regular season began in early September, Emerson men’s soccer coach Javier Mejia has not had a full squad. Injuries have piled up, and at one point this year, the team was missing six starters. A trio of teams were in action last Saturday at Emerson’s homecoming. The day’s events, which included an alumni soccer match and a catered tailgate, featured the men and women’s soccer team and the women’s volleyball squad all in New England Women’s and Men’s Athletic Conference action. The women’s volleyball team recently opened up New England Men’s and Women’s Athletic Conference play with a loss to Wellesley College last week, and is now preparing for a matchup against Springfield College on Saturday, Sept. 26. Which is harder: Graduating from college in three years with two degrees or getting the NCAA to let you play Division III soccer? For Alexandra Dezenzo, it was the latter.